Can Gaddar Emerge As A Key Challenger To KCR And TRS In Telangana? Home » Magazine » National » Can Gaddar Emerge As A Key Challenger To KCR And TRS In Telangana? The Congress-led Opposition, under the banner of Praja Maha Kutami (People’s Alliance), consisting of its erstwhile bête-noire Telugu Desam Party, the Telangana Jana Samithi and CPI, are extremely optimistic of giving a tough fight to the TRS in the coming polls. M.S. Shanker	October 18, 2018 00:00 IST Can Gaddar Emerge As A Key Challenger To KCR And TRS In Telangana? 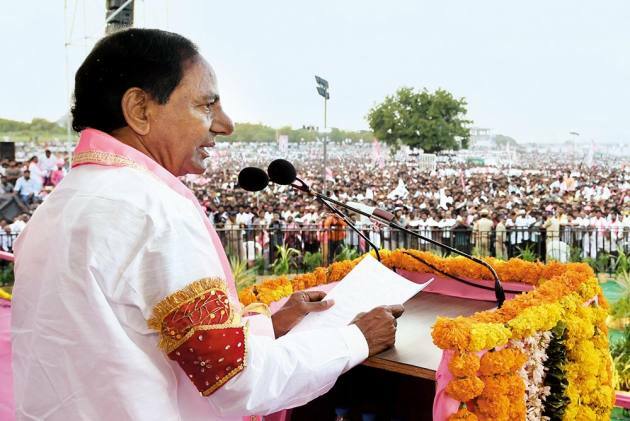 The tenor of the political ballad has been changing by the day ever since Telangana Rashtra Samiti (TRS) president K. Chandrashekar Rao (KCR) advanced the Telangana assembly polls to cash in on his government’s recen­tly announced welfare schemes. This week, it hit a high pitch with cultural act­ivist G. Vittal Rao ‘Gaddar’ meeting Rahul Gandhi and his mother Sonia. With him was his son Surya Kiran, who formally joined the Congress. After the talks, Gaddar, a strident critic of the Congress so far, said he would “campaign for all political forces to end neo-feudalism and stop fundamentalist forces from coming to power”. Can Gaddar emerge as a key challenger to KCR and TRS? At the mom­ent, it seems unlikely. Many feel Gaddar has become irrelevant since ‘left-wing extremism’ has more or less been wiped out from the new Telangana state. The TRS leadership dismissed Gaddar’s entry as “irrelevant and a non-starter”. “We are neither upset nor worried over the so-called understanding reached by Gaddar with Sonia and Rahul,” says Palle Rajeshwar Reddy, a close aide of KCR. “TRS is confident to retain power with an absolute majority as we have delivered what we have promised to people,” he says. KCR is set to address more than 100 meetings covering almost all constituencies after the Dussehra celebrations. But the Congress-led Opposition, under the banner of Praja Maha Kutami (People’s Alliance), consisting of its erstwhile bête-noire Telugu Desam Party (TDP), the Telangana Jana Samithi (TJS) and CPI, are extremely optimistic of giving a tough fight to the TRS in the coming polls. “People are vexed with KCR’s gimmicks,” says Prof Kodandaram, the TJS founder. “The so-called welfare schemes were not meant for all the people of Telangana, but only for his family. His development claims are a big hoax. The multi-crore irrigation projects are designed only to plunder the public exchequer,” he adds. Firebrand Congress leader D K Aruna too has challenged KCR for a public debate over his tall claims on irrigation projects. “Where is that 75 lakh-acre land which your government brought under cultivation?” she retorts in a video which has gone viral on social media. S. Jaipal Reddy, veteran Congress leader and former Union Minister, who many see as the possible chief ministerial candidate if the Congress wrests power, has come out with fresh corruption allegations against KCR and his family members. According to him, the KCR government has handed over irrigation projects worth Rs 60,000 crore to his coterie. “I dare KCR to deny the figure if he is clean and honest,” the senior Congress leader thundered at a rally recently. The campaign by both TRS and the Opposition has already been vituperative; it will only get shriller in the coming days.